Erma McGill an Outstanding Ag Literacy Volunteer! 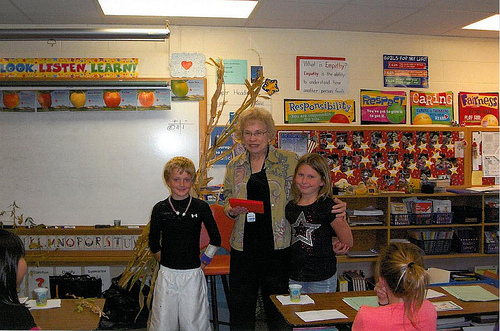 Erma McGill of Waverly, Neb., has been promoting and educating about agriculture as an Ag Pen Pal for 16 years writing and visiting classrooms. For the first two years Erma just visited classrooms and took brochures, samples of soy nuts, and soy milk, but for the last 12 years the classes have visited Erma’s farm. When the students arrive at the farm there are several stations: Station one is in Erma’s kitchen where a retired college professor tells students about seeds and crop protection schools. He also tells them the products they eat and use every day come from farms. 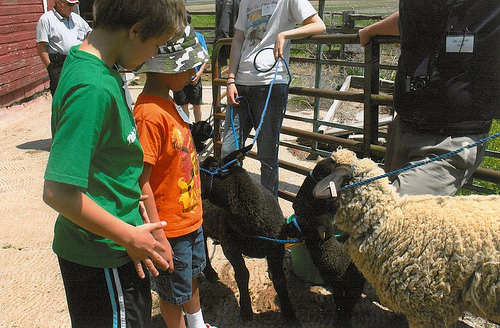 Stations two has farm animals where students get to pet and ask questions about the animals. At station three students have the opportunity to ride a horse. 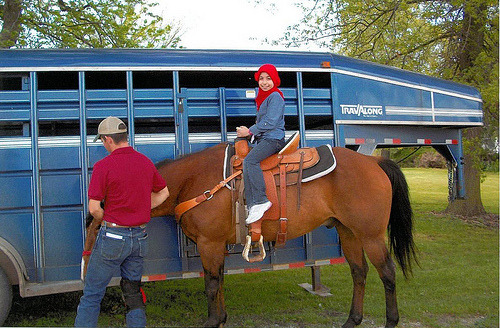 Erma’s adult children help with the horse rides. At station four the students get popcorn with soy popping oil, chocolate and white milk, soy nuts (chocolate and spiced) and ice cream cups! Erma’s latest ag literacy volunteering includes taking the “Beef Reader” to a neighboring school. The “Beef Reader” is patterned after the ever- popular “Weekly Reader.” It is a letter from a ranch boy telling what happens on his ranch. It has illustrations about cuts of beef and games to play about beef in our diet and recipes. Erma knows the value of volunteering. She also knows she cannot pull off these large scale learning opportunities alone. Her family, County Farm Bureau and friends are a big part of how it happens. Both Erma and her late husband have been Farm Bureau members since Farm Bureau started in Nebraska. Erma has also been involved with the Nebraska Farm Bureau Ag Promotion Committee as a committee member and as the chair for the last four years. Thank you Erma for being an outstanding example of a volunteer who is passionate and willing to educate her community about agriculture! Please Vote TODAY for Nebraska AITC to Win a Toyota Truck! The Nebraska Agriculture in the Classroom program has been selected as one of 500 nonprofit finalists in Toyota’s “100 Cars for Good” program, a major philanthropic initiative in which the automaker is giving 100 vehicles over the course of 100 days. Nebraska Agriculture in the Classroom was selected as a finalist from more than 5,000 applications nationwide and is up for consideration today. Voting will take place from 9 a.m. to 10:59 p.m. CDT. Click here to cast your vote! 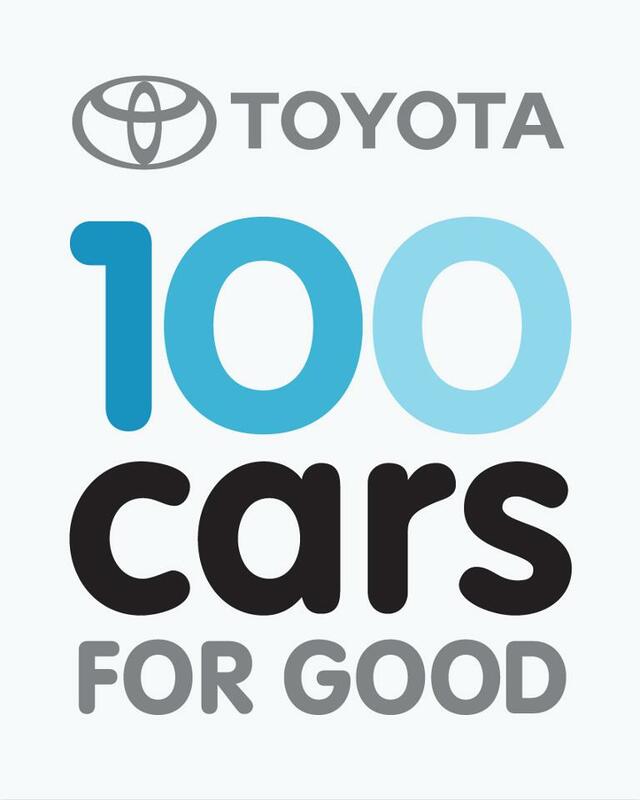 Beginning May 14, and each day after for 100 days, 100 Cars for Good is profiling five finalists. Individuals can vote for whichever nonprofit they think can do the most good with a new vehicle. The nonprofit with the most votes at the end of each day will win one of six Toyota models. Runners-up will each receive a $1,000 cash grant from Toyota. “Everyone involved with the Nebraska Agriculture in the Classroom program is thrilled to have been selected as a finalist for the 2012 100 Cars for Good program,” Deanna Karmazin, state coordinator, says. “We’re grateful for this incredible opportunity to showcase Nebraska agriculture and hopefully win a truck to help us increase our impact here in Nebraska. We hope everyone will help us spread the word now and, of course, will make time to vote for us today! A new truck would assist us in taking agricultural education materials, including animals, across the state to teach kids where their food, fiber and fuel come from. If the Nebraska Agriculture in the Classroom Program receives the most votes and is awarded the vehicle, it will be used to educate teachers and students across the state about the importance of agriculture in their daily lives and reconnect them with the knowledge of where their food, fiber and fuel come from. Agriculture in the Classroom is a nationwide educational program to help students develop awareness and understanding that agriculture is the source of food, clothing, shelter and other essentials of life. In Nebraska, the program is managed and funded by the Nebraska Foundation for Agricultural Awareness (NFAA), a nonprofit, tax-exempt organization with headquarters at the Nebraska Farm Bureau office in Lincoln, Neb. For more information on the Nebraska Agriculture in the Classroom Program click here. You can also like AITC on Facebook or you can follow AITC on Twitter.